The most dangerous person in the eyes of any totalitarian regime is the individual who is not afraid and thus will not be cowed. He or she may be in prison, tortured or physically broken, has probably been labeled a criminal or a terrorist in an effort to discredit them, yet remains unbowed, unafraid, even confident. Not necessarily confident in the prospect of liberation or triumph, but confident in the knowledge that the seemingly all-powerful regime cannot make the person capitulate and repeat the lies that every totalitarian state insists upon. For every dictatorship develops a public narrative that justifies why a small circle of people should hold political power, and thereby enrich themselves at society’s expense. These narratives, called variously doctrines or political programs or ideologies or philosophies, are in the end just big lies. That is why it is also necessary to control the media, the schools, the arts, the internet, public discourse itself, so that common sense questions and honest answers may not disturb the stability of the regime. In every society, however, there are truth-tellers, declining to live the lies. Vaclav Havel was such a one. He told his truth in the plays he wrote, and later, after being imprisoned for his artistic expression, in more directly political statements. Ten years after the Prague Spring, Alexander Dubcek’s attempt to develop “socialism with a human face,” was extinguished by Soviet invaders, and Czechoslovakia had settled into a long dark night, Havel wrote an essay entitled “The Power of the Powerless.” In it, he explained that oppressed people always contain “within themselves the power to remedy their own powerlessness” by “living in truth” in their daily lives. Havel and his friends subsequently wrote Charter 77, a declaration by citizens of Czechoslovakia that described and supported the human rights commitments their government had nominally made in the Czechoslovak Constitution of 1960 and in signing on to the 1975 Helsinki Final Act. For their troubles, they had to be suppressed, else others might learn what the state had promised – freedom to travel, to speak, to worship, and so on. So they went to prison and served hard labor. I come from a country where, as late as mid-1989, while all around us totalitarian icebergs were cracking and thawing, the stupid, repressive regime remained strong. Together with other people of a similar mindset, I was in prison. Yet by the end of that same year, I was elected the president of a free Czechoslovakia. Seemingly unshakeable totalitarian monoliths are in fact sometimes as cohesive as proverbial houses of cards, and fall just as quickly. This is always the fear of the dictator—the moment when the people no longer pretend to believe the lies, and are no longer afraid. Then the dictatorship may crumble, as so many have done. The increasingly repressive government of Russia, for instance, is afraid of Oleg Sentsov, a writer and film-maker. He is at the moment serenely embarked, even while on a hunger strike in a remote prison cell in northernmost Russia, on a daring crusade for the freedom of scores of fellow Ukrainians, unjustly imprisoned in Russian jails for peaceful opposition to the Kremlin’s brutal military attacks on its neighbor. Putin’s government is terrified that he might die, and also that he might live and be a heroic example to many others, in Ukraine and Russia. Khadija Ismailova, too, is another one, intrepid Azerbaijani journalist, exposer of official lies and corruption at the highest levels in Baku. She is out of jail now, after years behind bars for being a professional journalist, but remains marooned in a country that won’t let her work and won’t let her leave. And, in what must be seen as a harbinger of resurgent military dictatorship in Myanmar, two Reuters reporters, Wa Lone, and Kyaw Soe Oo, have just been sentenced to seven years in prison for accurately reporting on appalling atrocities committed by the Burmese military against the Rohinyga minority. Official efforts to control what is said and written in the country have gone to the absurd step of banning use of the word “Rohingya” in print or on the air – and both the BBC and Radio Free Asia are no longer able to broadcast in the country because they continued to call the Rohingya by the name they call themselves. All of them knew they risked imprisonment—or worse—for speaking and writing about crimes committed by their governments against the people of their own countries, and the lies told to deflect attention and evade accountability for those crimes. Yet they were and are unafraid. Consider now the prospects for truth-telling in the world’s most populous country, the People’s Republic of China, which has been evolving toward an ever more tightly managed totalitarianism since the ascension of Xi Jinping as paramount leader in 2012. The campaign to censor free speech and to suppress independent civic life takes many forms. One is hound people to their death with repeated imprisonments, and then to go after family members in order to keep them from telling the story. This was the story of Liu Xiaobo, who rose to fame in the 1980s with his literary critiques and eventually became a visiting scholar at several overseas universities. He returned to China to support the 1989 Tiananmen Square protests and was imprisoned for the first time from 1989 to 1991 for his involvement in the human rights movement.During his fourth prison term—in 2009 he was sentenced to eleven years for “inciting subversion of state power,” which is double-speak for being an author of Charter 08, the human rights manifesto that proclaims “we should end the practice of viewing words as crimes”— Liu was awarded the 2010 Nobel Peace Prize for “his long and non-violent struggle for fundamental human rights in China.” He was released from prison only on his deathbed, in June 2017. His spouse, Liu Xia, though never charged with any crime, was under house arrest from 2010 – until more than year after her husband died. She was finally allowed to leave for Germany in July 2018. She is under incredible pressure to refrain from speaking out, even from afar, because her brother, Liu Hui, is blocked from leaving the country. Gui Minhai, a Chinese-born Swedish writer and co-founder of Causeway Bay Books, was mysteriously detained last year. His video-taped confessions were described by the Washington Post as “messy and incoherent, blending possible fact with what seems like outright fiction.” The end result worked, however: China has to effectively censored an important writer and independent distributor of books. 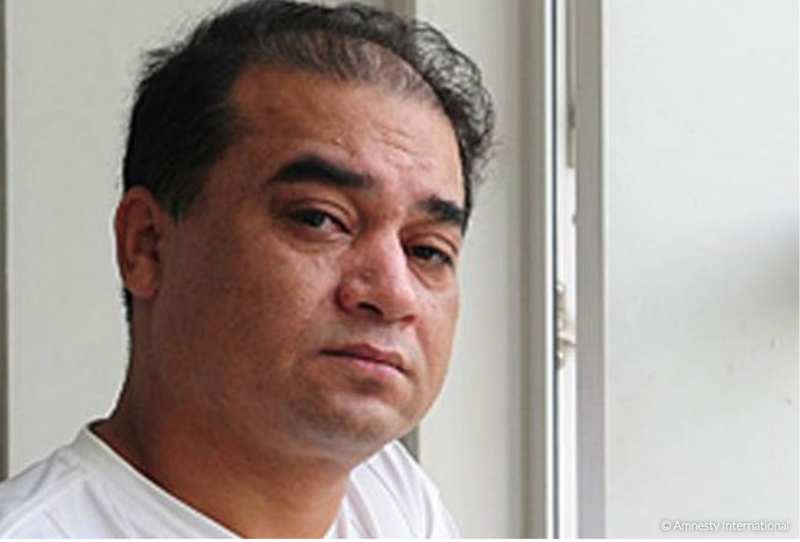 Another brave person languishing in the Chinese Gulag is Ilham Tohti, a modest if outspoken professor of economics who devoted much of his life to fostering better relations between the dominant Han Chinese people and the minority Uighur people, mainly Muslims who live mostly in the western Xinjiang province. In 2006, he founded a Chinese-language website called Uighurbiz to publicize cases where Uighurs’ rights were violated. The idea behind the site was to ultimately promote mutual understanding between Han and Uighur peoples. For years, in speeches, lectures and writings, he repeatedly emphasized his opposition to separatism, extremism, and terrorism. He focused on the rule of law and human rights, and advocated for full inclusion of China’s diverse ethnic minorities in China’s booming economic development. Chinese authorities have clearly decided that rather than find a way toward the mutual respect and inclusion advocated by Tohti, they would prefer simply to eliminate the language and religion that define the Uighur culture shared by more than eight million people. This year, on an accelerating pace, hundreds of thousands of Uighurs (and other ethnic minorities) are being swept into newly constructed indoctrination camps for what is called “transformation through education.” Children are being separated from parents and placed in ‘orphanages’ constructed only for them, where they can have their families’ religion and language erased from their memories. Human Rights Watch recently released a comprehensive report concluding that the human rights violations attending this campaign are of a “scope and scale not seen in China since the 1966-1976 Cultural Revolution.” This policy of mass incarceration has attracted the attention of the Trump Administration, which has threatened sanctions on the Chinese officials most responsible for this campaign. Ilham Tohti could be part of the solution to the rising tensions and polarization. Yet he was convicted four years ago on a false charge of promoting “separatism” and sentenced to life in prison. His family has lost contact with him. Seven students who worked with Tohti on his website have also been sentenced to years in prison. In 2015, Tohti’s niece was given a ten-year sentence for having photographs of Tohti on her smart phone and for contributing to articles about him on Radio Free Asia. His daughter, Jewher Ilham, lives in exile in the United States. The effort by the government of China to suppress free speech and honest discussion of complex social problems is widespread, well-known, and getting worse. You could Google this. Or you ought to be able to. Why would a senior executive of the company that claims to be the repository of all knowledge in the world not know the answer to such a simple, uncomplicated question? Any high school student—in China or in the United States—surely knows the correct answer. Since then, Google has clearly gone through a period of intellectual evolution, and has now arrived at a place where they have apparently reconciled with these forces. Anyone can (outside China) find online a report published earlier this year by my colleagues at PEN America titled Forbidden Feeds; Government Controls on Social Media in China. The report lays bare the destructive impact of the Chinese government’s vision of “cyber sovereignty” on netizens who dare to dissent. The report also includes documentation of 80 cases of Chinese citizens warned, threatened, detained, interrogated, fined, and even imprisoned for online posts over the past six years. The wide-ranging content of these posts, which touch on everything from Tiananmen Square to issues such as land rights and local corruption, demonstrates the ruthless enforcement of information control and the heightened risks facing those who dare test ever-evolving methods and powers of censorship. Mr. Enright and his colleagues at Google could do a quick on-line search for it—outside China, that is.